If you ever had problems with remembering the formulas in geometry class, this area of a trapezoid calculator is bound to help you. In just a few simple steps, you will be able to find the area of a trapezoid and determine all of its other properties, such as side lengths or internal angles. So, if you are troubled by questions like "how to find the perimeter of a trapezoid", look no further - simply keep reading to find out! You can also check out our circumference calculator to analyze the geometry of a circle in more detail. A trapezoid is a 4-sided geometrical shape with two sides parallel to each other. These two sides (a and b in the image above) are called the bases of the trapezoid. The other two sides (c and d) are called legs. h is the height of the trapezoid. You can notice that for a trapezoid with a = b (and hence c = d = h), the formula gets simplified to A = a * h, which is exactly the formula for the area of a rectangle. Calculate the remaining internal angles. As α + β = 180°, β = 180° - 30 ° = 150°. Similarly, as γ + δ = 180°, δ = 180° - 125° = 55°. Make sure to take a quick look at the hexagon calculator, too! 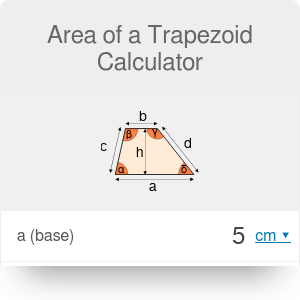 Area of a Trapezoid Calculator can be embedded on your website to enrich the content you wrote and make it easier for your visitors to understand your message.